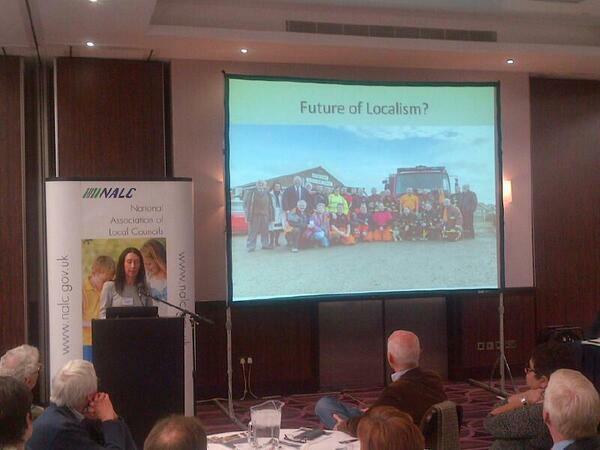 On Wednesday 26 March 2013 the National Association of Local Councils (NALC) held an event asking the question "What next for localism?" It was attended by everyone from parish councillors and clerks to the minister and shadow minister for local government. Also represented were academics, officers from principal authorities and the Local Government Association. "What next for localism?" is a useful to question to ask at this time. A general election is a year away and the flavour of government that will be returned is far from certain. Which isn't to say the political parties are offering dramatically divergent policies right now, there appears to be consensus for "more localism". However, the event was much more focussed on what those involved in delivering community governance had to say. The delegates had a few messages for the ministers. Delegates were keen to note that localism didn't just happen with the Localism Act 2011 or any other piece of legislation. Town and parish councils have been offering a wide variety of services for some time, either alone or more typically by forming partnerships with other tiers of local government or agencies. The flip side of this was a sense that the coalition hasn't "done localism" by passing the Localism Act. Another theme explored was that the powers available to councils, such as neighbourhood planning, right to challenge and right to bid will not be taken up by every council. Many councils felt able to achieve their objectives without having to 'challenge' anyone. There was also a fear of devolution of bureaucracy occurring, where new powers create new processes that waste time and resources. Perhaps unsurprisingly finance was a theme that came up. Councils have lost out because of changes to council tax support, where money isn't always passed on by principal authorities. Local councils are concerned about referendums for precept increases that might be implemented. Looking to the future, councils want to keep some of the business rates that are collected in their area, given their role in creating places for businesses to thrive. Housing came up as a theme throughout the day. Local councils are excluded from the New Homes Bonus intended to incentivise house building. As this scheme has not met its goals, devolving it to local councils could be the answer. It will also allow communities control over where houses are built. There was a sense that the removal of regional strategies hadn't devolved powers over planning enough and local councils needed to be involved. The reception to neighbourhood planning was surprisingly ambivalent. Smaller parishes with meetings rather than councils are excluded and even some parishes with councils felt it was too bureaucratic a process for too little gain. There was also concern that there wasn't adequate safeguard that plans would be followed. Annette Brooke, representing the Liberal Democrats on local government, said a right of appeal might need to be created. More radical ideas came from academics who suggested it was about time councils had a constitutional right to exist and shouldn't be granted that right and powers piecemeal from the centre. Principal authorities shouldn't have the power to remove councils and, ideally, everywhere should have a parish council. This frames "what next?" as whatever each council needs. It became clear that councils don't just use powers as they become available, they select them based on their own local requirements. The take up of parish councils and powers such as neighbourhood planning in London has been slow. The radical idea of systematically creating parish councils might be the only way to get these initiatives moving. However, localism is at best a "bottom up" exercise. Having a share of business rates might encourage parish councils to form in London that otherwise wouldn't. The fear of taxation through precept would be turned on its head with the prospect of a revenue stream being 'lost' without a local council to make use of it. The experience of councils outside London with regards to the new powers available could be useful to communities in London. Many were able to do the things they wanted through informal partnership working. So, perhaps the benefit of forming new parish councils in London isn't about gaining new powers, but creating a structure that will give the community a voice and the corporate form needed to act.